On Polling Matters this week I talked about what might happen to Labour’s support over the rest of the Parliament. 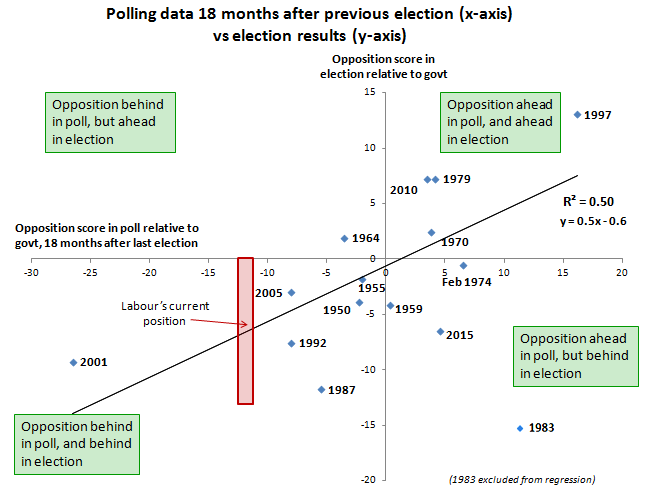 Regular readers of this site might remember that I’ve previously compared how oppositions have stood in the polls 18 months after elections with how they then did at the subsequent election (using Mark Pack’s brilliant collection of historical polling data). For this week’s episode I updated this analysis with the 2015 election (which was an outlier, as Labour underperformed how they’d be expected to do – largely because of the polling miss). The analysis suggests that, between this point in a parliament and the subsequent election, polling leads typically roughly halve. This happens regardless of whether it’s the government or the opposition that’s leading in the polls at this point. I found this surprising and it seemed like it can’t be right. I had thought that this was typically a low point for governments, and that they usually recover support by the time an election comes. But the evidence doesn’t really seem to bear that out – and it appears the opposition did gain ground ahead of the 2001 and 2005 elections. Obviously this is a crude model. It doesn’t take into account many things. But for what it’s worth it suggests that Labour – currently about 12pts down – is on course for a 6pt election defeat, which is less than I’d expected. But here’s another view on the question of Labour’s polling floor. 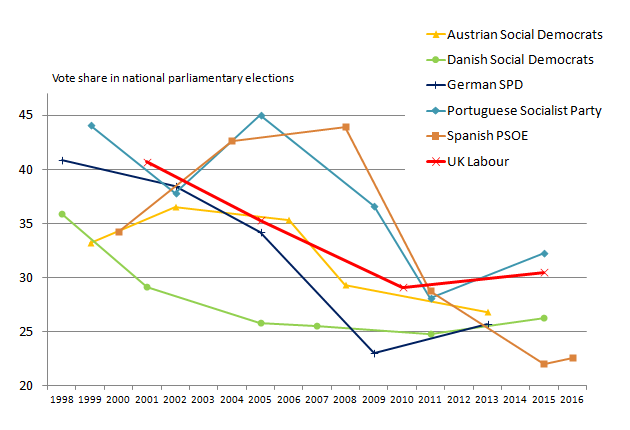 If we look at other centre-left European parties that, like Labour, were scoring between 35-45% in the late ’90s and early ’00s, we don’t see much evidence that Labour is currently at the lowest point it can get. All of those parties have scored lower than Labour in national parliamentary elections. Most of the others have gone below 25%. Clearly different electoral systems – and national politics – are an enormous factor. What happens in one country isn’t inevitably replicated in another. But this alone suggests that Labour has no assurance it can call on the support of 30% of the public at a general election. Other major centre-left parties have found that the ground can indeed fall away beneath them. I talked about this, along with Ukip and Theresa May’s in-tray, with Keiran and Asa Bennett of the Telegraph.